DESCRIPTION.- USNM 463118, from locality 13, is a body chamber with maximum preserved whorl height of 15.5 mm. Upper whorl face concave to accommodate lower whorl face of previous whorl; outer whorl face broadly rounded, juncture of outer and lower whorl faces narrowly rounded, lower whorl face broadly rounded. Ribs arise at upper whorl suture, are coarse, straight and prorsiradiate across flanks and link in pairs at strong tubercles at juncture of outer and lower whorl faces. An equal number of coarse, radially elongated tubercles lie close to umbilical margin. The two rows link across a concave zone by weak zig-zag ribs. Tubercles next to umbilicus give rise to coarse single ribs that extend across inner side of whorl, weakening progressively. Sutures not seen. Description: Sinistral and dextral coiling. Moderate1y evolute and trochospiral. Apica1 angle of 45-55 degrees and intermediate expansion rate result in an open umbi1icus on the abapica1 side. This umbi1icus spans c. 21 per cent of the whorl diameter. Whorl cross section is rhomboida1 and WB/WH c. 1·0-1·2. Approximate1y 25 single ribs per whorl are present internally and ventrally, and fork into pairs at sharp bullae on the lower flank or precise1y on the whorl contact. Where test is preserved these bullae are extended to form short triangular spines which rest in the interspaces of ribs of the succeeding whorl. A second row of tuberc1es or bullae is located on the inner whor1 contact. 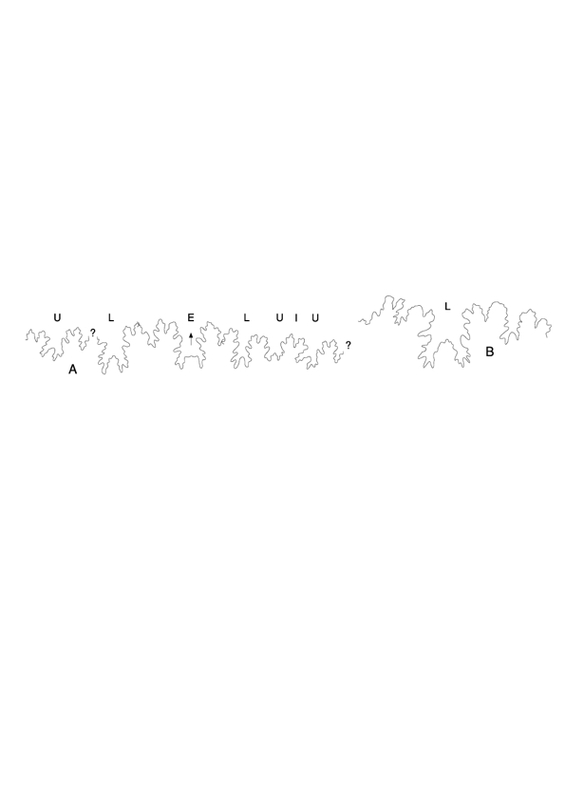 The two rows of bullae form a concave mou1d between them that accommodates the succeeding whorl. The suture line is simple and asymmetrie. The EIL sadd1e is broad, rectangular, 1itt1e incised and asymmetrically bifid. LlU, Land U are narrower and symmetrically bifid. TYPES.- These were from Noxubee County, Mississippi, but are lost. MATERIAL.- One specimen, USNM 463118. DISCUSSION.- Cobban (1974b) revised N. (N.) alternatum, the distinctive features of which are the presence of a simple rib on the outer whorl face with a row of long septate (tubercles on internal molds) at the juncture of outer and lower whorl surfaces, and a second row close to the umbilicus on the lower whorl face. OCCURRENCE.- This species is the index to the lower Maastrichtian N. (N.) alternatum zone (Cobban and Kennedy, 199 1 b), and occurs in the Prairie Bluff Chalk at locality 13 in Mississippi; the Navesink Formation at Atlantic Highlands, New Jersey; the Ripley Formation in Mississippi, Alabama and Georgia; and the Nacatoch Sand in Arkansas. Remarks: The species resembles N (N) approximans, N (N) hyatti and N (N) helicinum, species that do not have spines but rows of tubercles instead. These tubercles are located ventrolaterally with a short distance to the contact between succeeding whorls. 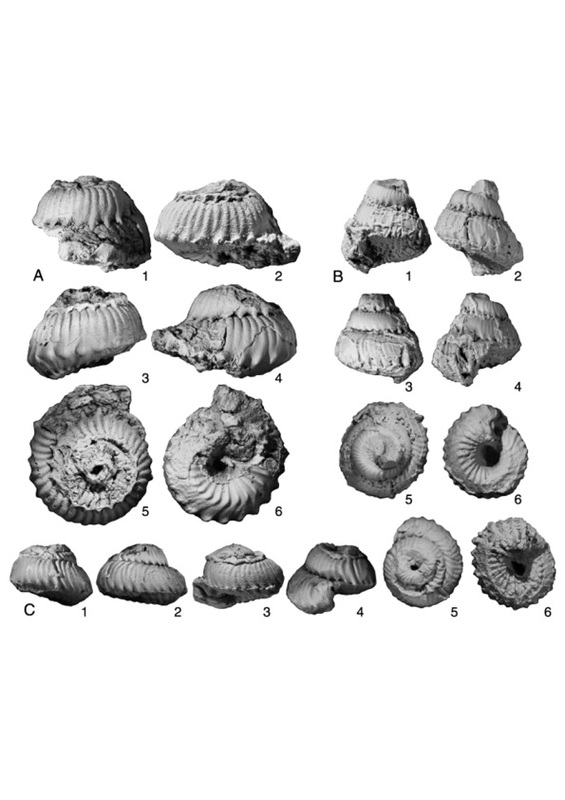 In addition, all other species of Nostoceras have rounded whorl sections instead of rhomboidal. The ornament resembles that of N (N) rugosum, which differs from N (N) alternatum in having a smaller apical angle and lower expansion rate. Cobban (l974b) and Cobban and Kennedy (l99Ib) described a size dimorphism characterized by uncoiling of the final hook at different sizes. Unfortunately no final hook is preserved among the Cerralvo specimens so that this dimorphism cannot be observed. Occurrence: Nostoceras (Nostoceras) alternatum (Tuomey) is an upper Lower Maastrichtian biozonal marker in the Ripley Formation of Mississippi, Alabama and Georgia (Cobban 1974a; Cobban and Kennedy 1991b). The species has also been reported from the Maastrichtian Nacatotch Sand in Arkansas (Cobban and Kennedy 1991a) and the Navesinsk Formation in New Jersey (Cobban 1974b).